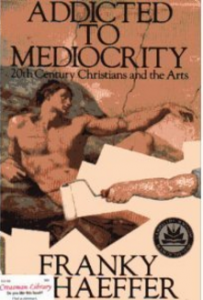 This is a ‘93 edition of the ‘81 book by the son of Francis Schaeffer. I have always enjoyed Francis, and Franky has a lot of his father in him. I do find Franky to be more caustic and possessing less patience with us Philistines than his father. He is, however, obviously well-versed in the field of art. Art is a field that we less-gifted are just now beginning to realize mirrors our culture. This is especially true in our postmodern culture where language and literature speak less truth than symbolisms such as art, music and technology. It is interesting to see Schaeffer’s references (in 1981) to such things as early postmodernism (p. 69), Tony Campolo’s socialism (p. 69-70) and the violent result of television (p. 80,118).